Check out Tobi's Tighten Up Belt Set We've made it nice and simple for you. The Tighten Up Black & Brown Belt Set is the only basic belt set you need in your closet. 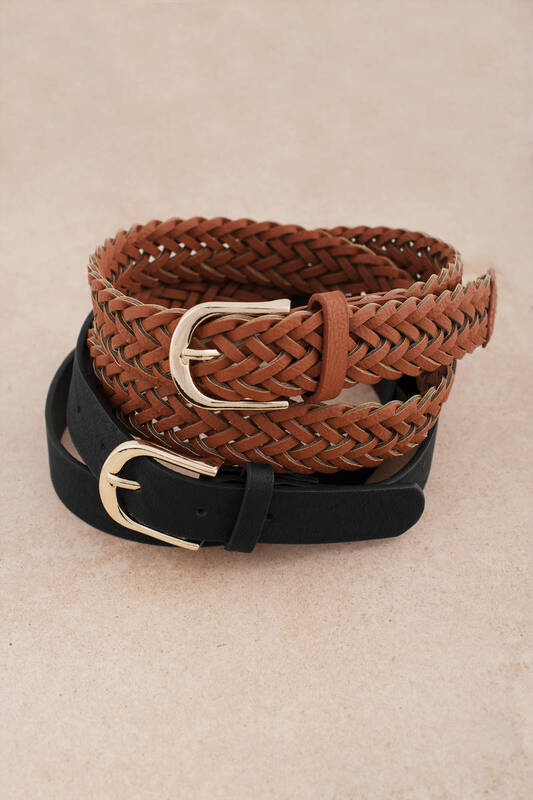 The brown faux leather belt is a classic braided belt in a woven finish with a metal buckle, while the black faux leather belt is a solid belt with a minimalist buckle. These vegan belts go with everything, so find any excuse to cinch that dress, pull up those pants, and keep everything together. We've made it nice and simple for you. The Tighten Up Black & Brown Belt Set is the only basic belt set you need in your closet. The brown faux leather belt is a classic braided belt in a woven finish with a metal buckle, while the black faux leather belt is a solid belt with a minimalist buckle. These vegan belts go with everything, so find any excuse to cinch that dress, pull up those pants, and keep everything together.